Okay, who else is completely obsessed with everything at J. Crew and J. Crew Factory this year, because I absolutely am. All their dresses so far seem to have such a flatter cut, their colors are summer perfection, and to top everything off, J. Crew bought back the Liberty print. Confession: I have already ordered from J. Crew and J. Crew factory three times within three weeks…I seriously need to break the cycle of this being a weekly occurrence, but they have been having such amazing sales lately. So since J. Crew is having yet another amazing sale this week I thought it would be fun to share a few of my current favorites! Love that J. Crew has bought back some of their signature colors and styles! I’m in love with everything too! Those lime pajamas are the cutest, and I’ve been obsessed with that pink dress since I saw Carly the Prepster wear it. 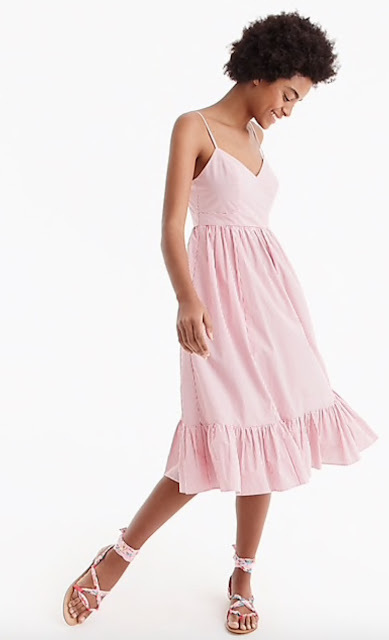 The pink dress is such a summer classic! I have been over the moon over J. Crew's new arrivals. There's so many cute things that I just cannot get over! I love that floral swimsuit, it's so cute for summer. I just ordered all their summer floral bikinis - I am such a sucker for a good floral print, especially when it is Liberty!